By Mhairi McNeil, Music Editor. Sometimes you just really need a laugh. This is what I sought after when I attended the Scottish Comedian of the Year 2014 Final in the 02 ABC. I wasn’t disappointed. Ninety different acts entered the competition but only twelve comics took to the stage to show the audience and panel of judges exactly why they deserved to be there. The night’s prize (£1,500 and a chance to play at the Adelaide and Edinburgh Fringe Festivals) went to the booming Bruce Fummey, with crowd-favourite Harry Garrison and his guitar winning second place and £500, and funny Farmer Jim Smith gaining third place and £100. You’ve been doing stand up for a year or two now, would you class yourself as a comedian yet? So when that’s your job title on Facebook? *laughs* Yeah, that’s when it’s official. If anyone asks I’d say “I do Stand up Comedy” I’d never say “I’m a comedian” – I think there’s a difference. When did you realise that you wanted to do comedy? It’s quite clichéd but I guess I’ve always wanted to do it, even though I only got into it around 2 years ago. In my Sixth Year of high school I won funniest boy and that made me think “am I actually funny?” – “Is this something I can get paid to do?” But it wasn’t for a couple of years that, after a few cans of “Dutch Courage”, I applied to do The Stand open mic night. It’s called Red Raw and it’s on Tuesdays in Glasgow and Mondays in Edinburgh. I’ve done it in Edinburgh a few times but mostly in Glasgow. Did you get a good reception your first time? Yeah I think so. At the time I didn’t have anything to compare it to, but I remember getting laughs and thinking “this is amazing!”. Looking back it was probably only half the room… But it wasn’t bad for my first time. I’ve heard some horror stories about people’s first time. What do you think is most important when you’re starting out? You really have to go for it. You can’t do one gig every few months; you just have to keep at it. Would you say that within the Glasgow or Scottish comedy scene there’s something for everyone? There’s a growing interest in alternative comedy like character or musical acts or live sketches that I don’t think you would have found 10 years ago. Although my act is quite traditional, I’ve tried to stay away from clichéd comedy as much as possible. I think that topical comedy has a short shelf-life before it’s irrelevant, like the referendum. I try to think when I’m writing if it’s been done before and if it has I’ll try to put my own spin on it. Do you think that if you had won on Sunday you’d have changed your set to make it more inclusive to Australian audiences? Definitely. Even within Scotland there can be differences between what’s funny. For example, part of my act has a joke about a boundary charge that’s apparently only a thing in Glasgow. But I’m assuming you were able to work on that during the summer when you were at the Fringe. How was your first run? It was brilliant. We did 25 or 26 days so pretty much the full run and out of that I’d say that only 5 or 6 shows were bad, and 15 or something were really amazing. The Fringe is difficult because you could have someone from North Carolina not understanding a word you’re saying, but I couldn’t have asked for a better first Fringe. 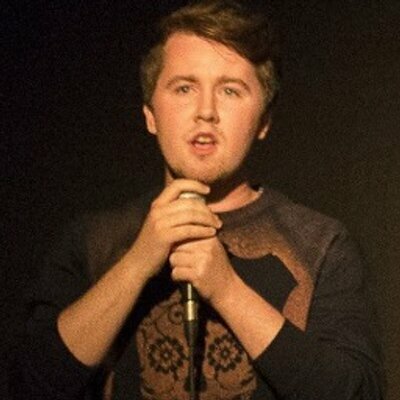 What would you say have been the key highlights for you between being named “Funniest guy” in Sixth Year and standing for Scottish Comedian of the Year last weekend? My first show at The Stand, I was lucky to have a good gig to start off with, and then probably the Glasgow Comedy Festival in March this year, that went really well and of course the Fringe. But I think if you’ve been at it for 3 or 4 years and don’t have regular paid work then you should reevaluate your options, so if I’m not getting that in a year or so I’d probably be disappointed. I can see the reason why stand up appeals to you, would you say you’ve turned your passion into a career? People say not to turn your hobby into a career but if you can be paid for doing what you love then I think that’s the goal. I’ve been officially paid twice and it wasn’t even that much but it’s a great feeling. If people are enjoying it and I’m getting paid for it, that would be the best thing I could ask for. To wrap up, what would you say is the biggest perk of doing stand up? The high you get from it. If it’s a really good gig, it’s hard to come down from it for days. I think the biggest perk is that it makes you happy, even if that does sound a bit cheesy. So hopefully we’ll be seeing a lot more of Stephen and his easy-to-love stand up. This incredibly down to earth guy could definitely be another one of Glasgow’s great exports. And as his star continues to rise, I’m sure it won’t be long until his Comedy career is Facebook official.